How do you know that solar modules are becoming a household thing? The answer is simple: when Ikea starts selling them. And that’s exactly what’s starting to happen. Swedish flat-pack furniture giant will start selling residential solar panels at its stores in Britain, the first step in its plan to bring renewable energy to the mainstream market worldwide. That’s great. Mainly because Ikea has the power to make it happens. Meaning, to bring renewable energy to the masses. The company started selling solar panels made by China's Hanergy in its store in Southampton on Monday. It will sell them in the rest of Britain in coming months, it said. And after this British trail run, the company is intending to go global. A standard, all-black 3.36 kilowatt system for a semi-detached home will cost $9,200 (7000 euro) and will include an in-store consultation and design service as well as installation, maintenance and energy monitoring service. The price is competitive but you can still find out there some less expansive systems with the same output. "In the past few years the prices on solar panels have dropped, so it's a really good price now," IKEA Chief Sustainability Officer Steve Howard told The Associated Press. "It's the right time to go for the consumers". The solar panel investment will be paid off in about seven years for an average home owner in Britain, Howard said. "If you are going to be in your house that long, your energy will be free after seven years," he said. Well, saying does not make it so. If ikea do start selling solar panels worldwide, it will have to learn every local market and its conditions. For the time being, Ikea picked Britain as its test market because it has the right combination of mid-level electricity prices and government-sponsored financial incentives that make investing in solar energy attractive to consumers. It remains unclear why the furniture giant chose to work with Hanergy, but it is well known that Ikeas has worked with the Chinese company in the past. In June 2012, Hanergy announced its strategic partnership with IKEA to install photovoltaic modules on IKEA owned buildings in China as part of its goal to promote the undertaking of energy efficiency and emission reduction. 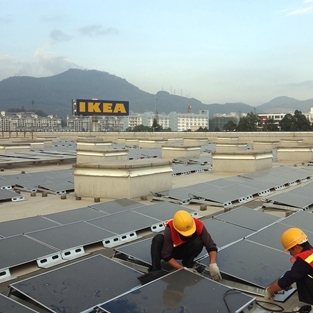 Through one year’s efforts, thin-film photovoltaic modules have been installed and tested via trial runs at IKEA stores in five cities across China, including Beijing, Shenzhen, Dalian, Nanjing and Shenyang. The installation will soon be carried out in IKEA stores in other cities, including IKEA’s distribution centre. The solar power generation project will be popularized to IKEA suppliers in China. Take the IKEA Beijing Store for example. Its rooftop installations have an installed capacity of 416.24kW, generating approximately 452000kWh every year, which translates into an annual reduction of CO2 emission by approximately 426 tons. The store has become the first business facility in Beijing to have been granted grid access for its rooftop grid-connected solar power generation installations by the Beijing Electric Power Company. Conclusion? What’s good for Ikea is also good for its consumers.